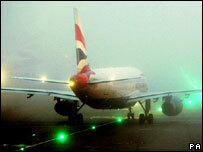 A rise in bookings has been reported by Eurostar and P&O Ferries in Dover after thick fog grounded hundreds of planes. The third day of travel disruption saw more than 300 flights cancelled at Heathrow affecting about 40,000 people. The cross-Channel rail operator and the ferry firm said bookings were up by 15% on last year although Eurostar said it had expected to be busy. Most Friday services were full and an extra train to Paris was laid on to cope with demand. Gareth Headon, Eurostar spokesman, said: "It was going to be very busy anyway tomorrow but since the problems began at the UK airports we have seen a big increase in passenger numbers - at least 15% on what we would expect to carry before these problems began." Ferry operator SeaFrance said it had no spaces left on Friday with very few places available on Saturday. P&O said there was still availability but there had been an increase in last-minute bookings. Brian Rees, from P&O Ferries, said: "We have got this surge in traffic at short notice and people have literally been turning up at the port saying they have given up hope of flying for Christmas." Thousands of Christmas travellers were hit by cancellations and delays because of low visibility caused by thick fog. British Airways cancelled all domestic flights from Heathrow although it said it planned to start operating domestic services to and from Heathrow from noon on Saturday. Gatwick was not so badly affected with passengers experiencing an hour's delay with their flights. Some London flights were diverted to the airport at Lydd, Kent, which was unaffected by the weather. A spokesman for London Ashford Airport in Lydd said several charter aircraft used its facilities on Friday. The airport, which has submitted plans for a runway extension and new terminal building, saw 65 flight movements, including takeoffs and landings, on Friday. Operators there want to expand the airport to cater for a 100-fold increase in passenger numbers from fewer than 5,000 now to half a million annually, and ultimately raise that figure to two million.